How does one compare the quality of a good Omega-3 supplement with hundreds of Omega-3 supplements available on the market today? This FREE Omega-3 Consumer Guide prepared by A-M B-Well Inc. will give you information on fish oil that is not normally available to the unsuspecting consumer. In this Guide you will find information that will help you make a better informed decision on how to choose a good quality Omega-3 supplement to improve one's health and the health of your whole family. This Guide will also inform you about features to look for in a fish oil, while giving you a better understanding of the differences. Why Purchase A-M B-Well PGFO? 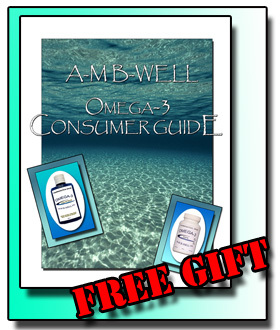 This Guide also will explain why A-M B-Well Inc. are the Pioneers of Pharmaceutical Grade Fish Oil in Natural 40:20 TG. This is a FREE e-book in PDF format that you can download to your computer or read online by clicking here. The Guide is in PDF format, a universal format that can be read by any computer with Acrobat Reader, a free utility from Adobe available here. To save the document, click on this link with the right mouse button and select "Save Target As" (PC) or click Ctrl+Command key and choose "Save Link As" (Mac). The file is verified to be virus-free.